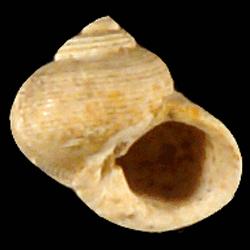 Key morphological features: The Turbinidae are small to medium-sized gastropods with globose, turban-shaped, solid shells. 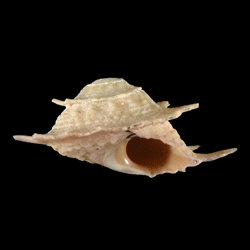 Whorl shoulders can be prominent or indistinct depending on the species, resulting in a more conical shape to the shells in the latter case. The spire is of medium height and there is no siphonal canal. 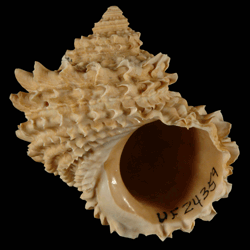 The shell exterior is smooth in some species, while in it exhibits noded spiral cords with or without broad triangular spines or axially elongated knobs. The aperture is subcircular, broad, open and nacreous. The labrum is smooth internally, and the columella is smooth and curved. The operculum in this group is calcareous. Sources: Davies, A.M. 1971. Tertiary Faunas Vol. 1, second edition. New York: American Elsevier Publishing Company, Inc. 571 pp. ; Tunnell Jr., J.W., Andrews, J., Barrera, N.C., Moretzsohn, F. 2010. Encyclopedia of Texas Seashells. College Station: Texas A&M University Press. 512 pp. Geological range: Middle Triassic to Recent (Davies, 1971). Geographic distribution: A distributional map for modern Turbinidae may be accessed from OBIS. 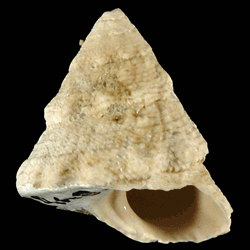 A distributional map for ancient Turbinidae may be accessed from the Paleobiology Database. Diversity: There are 164 recognized living species of Turbinidae and 17 genera (WoRMS database, unvetted). 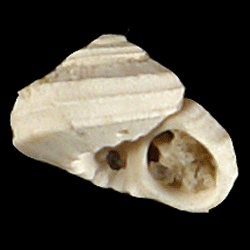 The Paleobiology Database recognizes 78 fossil genera and 480 fossil species of Turbinidae (unvetted). Phylogenetic status: Paraphyletic. The molecular phylogenetic analysis of Williams and Ozawa (2006) supports the paraphyly of Family Turbinidae.